Two bedroom secluded villa near centre of Üzümlü Village. One double and one twin bedroom, both with en-suite bathrooms. Jacuzzi in double bedroom. Large pool terrace with panoramic views. This charming secluded villa was built in 2016, has two bedrooms and is located approximately one kilometre from the centre of Üzümlü Village. The accommodation consists of a large lounge with an open plan kitchen, opening on to the generous pool terrace, one double bedroom and one twin bedroom, both with en-suite bathrooms. The double bedroom has a large Jacuzzi from where guests can enjoy the same panoramic view across to Patara Beach as that from the pool terrace. The infinity pool is 7.5 x 4 metres and 1.55 metres in depth, and has steps down into it to facilitate easy entrance. The adjacent children's pool is 2 x 1.5 metres and 70 centimetres in depth, and with a seating ledge that enables adults to enjoy it also. The pool terrace is furnished with four sunbeds, 2 umbrellas and side tables, and a dining area with barbeque located under the shady canopy. 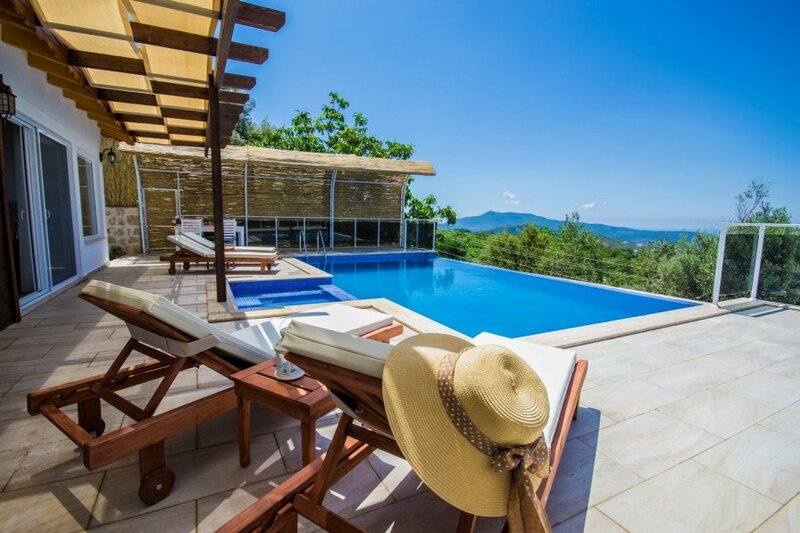 The villa is air-conditioned throughout and has a wi-fi internet connection. There is a local grocers shop approximately 1 km from the villa, where guests can purchase basic essentials, and also delivers free of charge. The sophisticated resort town of Kalkan is some 8 km from the villa, 10-15 minutes drive. Patara beach is 20km drive from the villa. The location and landscaping results in a high level of privacy of the villa, meaning that is is suitable for guests with high privacy requirements, be it for religious or other reasons. N.B. : Check in and Check out times may be flexible depending on the arrival and departure time of other guests. Please contact us with regards to your flight times and where possible we will try to be flexible.